Açıklama : The sprawling Caloris basin on Mercury is one of the solar system's largest impact basins, created during the early history of the solar system by the impact of a large asteroid-sized body. 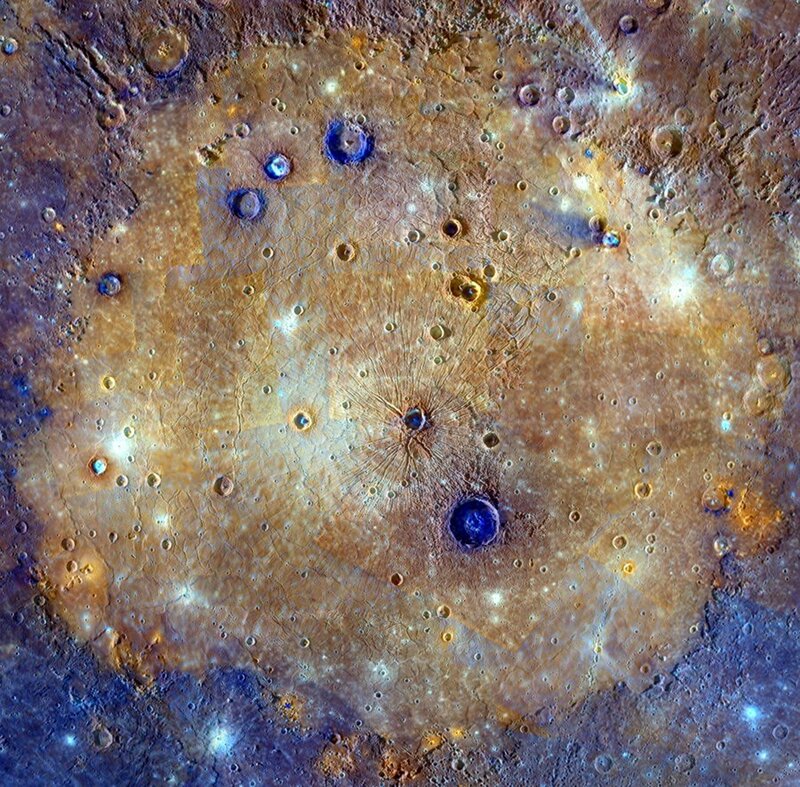 The multi-featured, fractured basin spans about 1,500 kilometers in this enhanced color mosaic based on image data from the Mercury-orbiting MESSENGER spacecraft. Mercury's youngest large impact basin, Caloris was subsequently filled in by lavas that appear orange in the mosaic. Craters made after the flooding have excavated material from beneath the surface lavas. Seen as contrasting blue hues, they likely offer a glimpse of the original basin floor material. Analysis of these craters suggests the thickness of the covering volcanic lava to be 2.5-3.5 kilometers. Orange splotches around the basin's perimeter are thought to be volcanic vents.